After a failed attempt last year to land on Skomer island Pembrokeshire, this year we decided to return to the Farne islands. Although the weather was fantastic both days, a combination of strong winds far out to sea and the new moon tide, prevented us from landing on Staple island. However this did not affect our visit to Inner Farne, shortly after disembarking our boat and as we climbed the path to the top of the island, the Arctic terns wasted no time in attacking our heads. Each year Arctic Tern’s fly thousands of miles to nest on the island, there are so many Tern’s on the island the birds nest anywhere possible. Nests can be seen on the walls, in the grass and along the edge of the walk ways. Every day before the island is open to the public, the resident RSPB wardens re-adjust guide ropes along the wooden pathways so visitors do not accidentally harm nest close to path. The Arctic Turn’s story is one of many, the island is a temporary home and breading ground for Black Headed Gulls, Guillemots, Shag, Kittiwake, Sandwich Turn, Common Turn, Razorbill, Herring Gull and of course the Puffin. 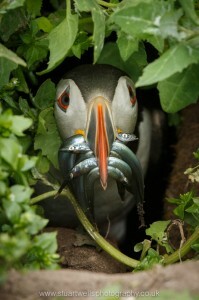 On this trip the main story that was played out over and over is one of feeding for the Puffin. Across the island Puffin have burrowed in to the soft soil that lay on top of the island rocky structure, Each year new burrows are dug and old are revisited. Once the chick of the breading pair hatches from its egg, parent Puffin’s fly out to sea to catch Sand Eels to feed the chick. As the comical Puffin returns to the island and lines up for a typical clumsy landing, Black headed Gulls are already poised and waiting. As soon as the Puffin lands on the ground the Gulls attack, experts at mugging the Puffin for as many if not all of the food intended for the Puffin chick. 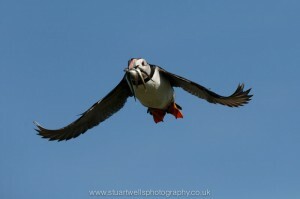 Not all is lost for the Puffin and not every fishing trip is lost to the Gulls. If the puffin is fast once on the ground, his little waddle will get him to the nearest burrow before the Gull reaches him. Even if the burrow is not his, the Puffin will enter to escape the thieving Gulls. The Puffin knows that after a short while the Gull will loose interest and other inbound Puffin’s will draw the Gulls attention away from the burrow being used as refuge. Once the coast is clear, the Puffin will gingerly appear from the hole making sure the Gulls are not there, then dart off to the correct Burrow, in some cases the Puffins burrow is just next door. After the chick is fed, once again the Puffin heads back out to sea for more Eels and to run the gauntlet of the Black Headed Gulls.